One of the most exciting things about the Australian charts from 1990 onwards is that information about positions 51 to 100 is readily available. Well, exciting for chart geeks like me, that is. 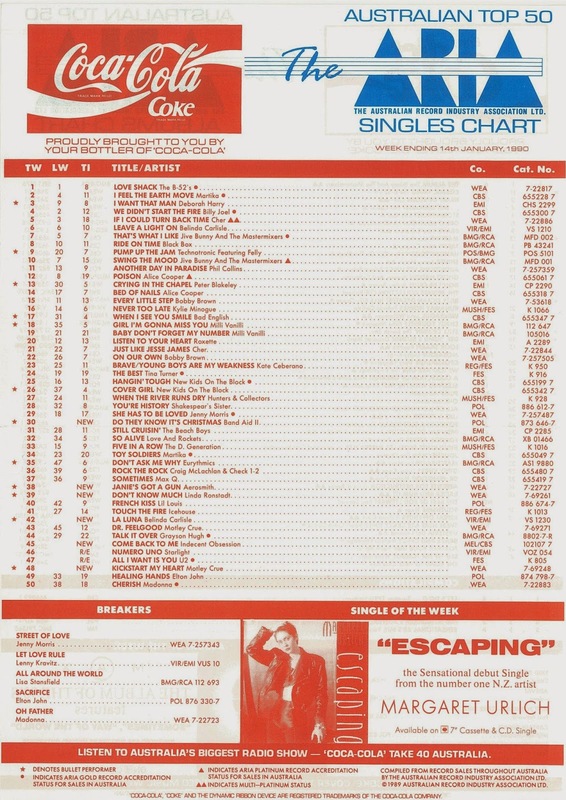 For some reason, when ARIA took the compilation of the charts in-house in mid-1988, they didn't reveal any positions outside the top 50 until the start of 1990 - although I've been able to find some of those out for the purposes of this blog over the past couple of years. With all of the top 100 info at my fingertips from now on, I thought I'd add a section to my weekly post where I list the new entries that didn't make it as far as the top 50 - and didn't wind up as a Single Of The Week or a Breaker. I won't go into them too much, since they're mostly long-forgotten flops, but there will be the odd overlooked classic in there (maybe not this week, though). EDIT: I've since been able to add this section for all my 1988 posts and will add it to my 1989 posts throughout 2019. A song that could never be called overlooked is "Love Shack" by The B-52's, which held onto the number 1 spot and had established itself as the song of the summer by this stage. We'll see the song that ended up deposing it from the top make its debut this week. Lead single "Mixed Emotions" had been a top 30 hit in 1989, but this second release from Steel Wheels made the most fleeting of visits to the top 100. In the UK, this ballad was their eighth and final top 10 hit but the Australian public passed on Bros' latest, written about the death of Matt and Luke's 18-year-old stepsister, Carolyn, in a 1988 car accident. Performed by future top 30 act Troy Newman (who took over the role from Russell Crowe), this was taken from the soundtrack to the stage musical written by Return To Eden villain Daniel Abineri. It had all been going so well! After three smash singles, which all made the year-end top 50 for 1989, the Like A Prayer campaign hit a snag when fourth single "Oh Father" bombed in spectacular style. By peaking at number 59, "Oh Father" became the lowest charting single of Madonna's career up until this point in Australia (side note: international singles "Everybody", "The Look Of Love" and "Spotlight" were not released locally). It was a similar story in the US, where the ballad became her first single since "Holiday" not to make the top 10, peaking at number 20. In the UK, "Dear Jessie" was released instead at this point (and reached number 5), but the curse of "Oh Father" continued six years later when Madonna's British label issued the song to promote Something To Remember and it also became one of her only singles not to reach the top 10 there, getting no further than number 16. I, for one, quite like the song but no doubt most fans in Australia already had the album. "Dr. Feelgood" had given them their biggest chart hit in Australia in 1989, but Mötley Crüe didn't do quite as well with this frenetic follow-up - and it was the same story in the US where the number 27 peak of "Kickstart My Heart" paled in comparison to the top 10 hits either side of it. Written by bassist Nikki Sixx about his near-death experience following - what else - a drug overdose in 1987, the track is probably my favourite song by the decadent band, although that's not saying much. After two upbeat pop hits, it was time for the obligatory big ballad - complete with kiddy choir and key change - for Indecent Obsession. If this were the UK, the school hymn-like "Come Back To Me" would've been released slightly earlier and been in the running for the Christmas number 1 spot - it certainly sounds like a third-rate "Stay Another Day" by East 17. In Australia, the song only just slipped into the top 40 and was pretty much the death knell for the band's career locally, even though they'd bravely soldier on for a few more years. It was an improvement on the performance of the second singles from her previous two albums, but "La Luna" still fell some way short of living up to the top 10 success of "Leave A Light On" (just as "I Feel The Magic" and "I Get Weak" disappointed after "Mad About You" and "Heaven Is A Place On Earth" respectively). The Latin-flavoured "La Luna" wasn't actually lifted from Runaway Horses in the States - instead "Summer Rain" was chosen as single number two there. And, even though "Summer Rain" would eventually be released here, I can't help but think the Americans got it right with their pick and "La Luna" should probably have been left to later. A quintessentially '80s ballad, "Don't Know Much" had indeed been around for the entire decade, first recorded by co-writer Barry Mann for his self-titled album in 1980. Covered over the years by artists like Bill Medley (who released it as a single in 1981) and Bette Midler (whose 1983 version was re-titled "All I Need To Know"), it had never been a big hit. Turned into a duet by Linda Ronstadt and Aaron Neville, and given a more rousing feel, the song finally connected - and how, reaching number 2 in the Australia, the US and the UK. Easily the best version recorded of "Don't Know Much" thanks to Linda and Aaron's effortless vocals, the duet became an instant wedding dance and love song dedication favourite. They were known more for good-time tracks like "Walk This Way" and "Love In An Elevator", but it was this significantly more serious song about an abused child growing up to take revenge on the father who molested her that gave Aerosmith their first substantial hit in Australia. It even spent a week at number 1. Not sure what that says about us, although it's probably fair to say "Janie's Got A Gun" was always going to get a lot of attention regardless of who performed it, thanks to that subject matter and the dark music video directed by David Fincher. On my first 1985 recap, we saw the original version of "Do They Know It's Christmas" debut on the Australian chart - and exactly five years later, a new version produced by Stock Aitken Waterman arrived. Featuring most of the Hit Factory's stable of artists (Kylie, Jason, Bananarama, Sonia, Big Fun) as well as big pop acts of the day like Wet Wet Wet, Bros and Lisa Stansfield, it once again raised money for famine in Africa. All but written out of Band Aid history in the wake of the "more credible" versions released in 2004 and 2014, the charity song was as popular as it's ever been in 1989, taking out the UK Christmas number 1 spot and staying there for three weeks. In Australia, this belated entry position was as good as it got - and it remains the only version of the song not to make the top 10 locally. Next week: the arrival of two new female vocalists who'd take the world by storm in 1990 - one of whom you can see in the YouTube screenshot just above. Plus, a song taken from the film debut of another Band Aid II contributor. Before that, I'll pop back to 1985 on Tuesday to see what was happening on the ARIA singles chart 30 years ago. I'm surprised this chart doesn't have the 'for detailed chart information, send $100 to...' blurb at the bottom, given the ARIA Report had commenced. Though I don't remember noticing it until late 1990, I think. I never did send the $100. I probably would have saved my pocket money for it if I'd known it was for the full top 100. 'Rock and a Hard Place' spent a few weeks on the AMR top 100 in late 1989, so I wonder if the #99 ARIA peak was its overall peak, or just its peak for 1990? I never heard 'Sister' until some years later. Quite strange I never caught the video at the time. 'Oh Father' was the first Madonna song I really liked, so naturally it was a flop. I didn't catch the video anywhere either at the time, oddly. Perhaps the lips sewn shut scenes were too gruesome? I'm surprised Indecent Obsession didn't shoot a proper video for 'Come Back To Me'. Maybe they wanted to prove they were a 'real' band and not just a boy band? I thought 'Runaway Horses' should have been a much bigger hit from Belinda's album, but 'La Luna' really doesn't scream 'hit' to me. 'Janie's Got a Gun' was really quite an unexpected smash, though it deserved to be, I thought. From the subject matter, the length of the song, and even some of the instrumentation used (almost sounds like a triangle being used for percussion in the verses). I only heard the Band Aid II song a handful of times when it was in the top 8 at 8 on Triple M. I remember catching the tail end of a 'current affairs' show (either A Current Affair or Hinch) with a segment on the song, and featuring snippets of the video. But, oddly again, I never saw the video proper until the late 00's. For the solitary week it spent in the top 50, rage aired one of their interludes instead of the video, though when recently asking viewers for Xmas-themed songs to air, I suggested this one, wondering whether they had it (because it didn't air when it was in the top 50)... and was told that the ABC do indeed have an archive copy of it, and that I should 'remind' them to air it next year (along with Band Aid 1). It really is an awful version though... but still better than Band Aid 20 and no doubt 30 (which I haven't heard yet). 1990 really was an epic year in music! The first CD I ever bought was called Let's Do It 2 and it featured a lot of the songs from this era. When you see the tracklisting (ten of the sixteen songs made the 1990 year end top 30) of the mammoth hits it makes you wonder if any compilation has ever come close post 1990. (The compilation "U Can't Touch This" which was also released in 1990 was also pretty solid). I rate La Luna and think it's a pretty decent song. Am also surprised Kickstart My Heart wasn't a bigger hit. It's quite a catchy tune and does have a vibe to get the blood pumping. 1990 is still one of my favourite years in music. Very memorable year from start to finish. Finn, (if Gavin doesn't mind) you can send a message with your contact details to one of my youtube channels (ohnoitisnathan49 is my current one, the others I check once a fortnight), and I can oblige your request. Officially, you could try contacting ARIA. They used to publish the ARIA report each week and you could pay for that so they may have some arrangement in place for obtaining old charts. Or, drop me a message at gavinscott75@gmail.com and I can point you in the right direction for finding stuff online. Ahhh our first full 100 chart recap, bless. Anyway I really like 'Rock and a hard place' infact I actually enjoy that album still to this day. 'Enemy of the sun' is and always will be a big steaming turd! I guess your right about the millions that had already spent their hard earnt on Madonna's album, just feel really bad it just missed our 50 by 1. Oh father! To me 'Kickstart My Heart' screams bigger hit than 'Dr. Feelgood', Motley Crue really didn't set my world on fire anyway. I played the video for 'La Luna' the other week from my collection and nobody in the room remembered it, to it sounds really dated and one of my least faves of hers from the 90's. Big hit in 'Don't Know Much' still hear it a lot today on the oldie station, like it but don't love it. As with the previous 'Janie's Got A Gun' is one of those tracks I have mixed feelings on, if I hear it to much I dislike it alot more. Finally the less we say about the Band Aid offering the better, it's probly the worst version for me. Oh Father is a Madonna song I always liked. I had taped the Like A Prayer album off a friend's copy in 1990 and loved the whole thing. The song peaked outside the Top 40 though, which was almost unheard of then - the only other Madonna single that had missed up to that point was the little-known The Look Of Love in 1987-88 from Who's That Girl (though a Top 10 in UK). The Band Aid remake was charitably worthy, but musically unnecessary, since it had been only 5 years since the original (the first 7" single I ever bought). I had a soft spot for Come Back To Me by Indecent Obsession, though it missed the Top 30, I still bought a copy on Cassette single. The group were from Queensland, which was still somewhat a rarity then as most Aussie acts hailed from NSW or Victoria still. Completely agree with you about Kickstart My Heart. It's the only Motley Crue song I like. I had it on the 1990 compilation album Let's Do It 2, on which it was Track 8 on Side 1, I recall, and brought that side to a resounding heavy conclusion! 'The Look of Love' was not issued as a single in Australia; so, technically, it didn't 'miss'. For some reason, Warners chose not to issue "Oh Father" in a picture sleeve, which may have deterred Madonna fans from picking up a copy for their collection (this might have seen it creep into the Top 50). MTV premiered the video (I was completely stunned that "Oh Father" had been chosen as the fourth single and was sure, right up until Richard Wilkins said, "Oh Father" a second before the video started, that they were about to premiere "Til Death Do Us Part"). Radio airplay was non-existent (I don't recall hearing it even once) and I only saw the video a couple of times on MTV and Rage. A real shame, as it's a fantastic song and still Patrick Leonard's favourite amongst his many classic Madonna co-writes/co-productions. The Australian 'Oh Father' cassingle had a picture sleeve. I guess perhaps due to some of the scenes in the video (the father hitting the child - or at least, that's what is alluded to, whether you see it or not; and the sewn lips in the casket), it wasn't deemed suitable for Saturday/Sunday morning viewing. I never saw the 'Oh Father' video, at the time, and only caught a glimpse of it in the music section of my local K-Mart when they were airing the 'The Immaculate Collection' video (with the sound down).